Well, if you want the best stroller for 3, 4, and 5-year-old (preschool children), I’m here to help you find the right option for your kid. I do understand how deep and dense the world of strollers can be, often making it tricky for parents to find the right strollers when traveling with kids. 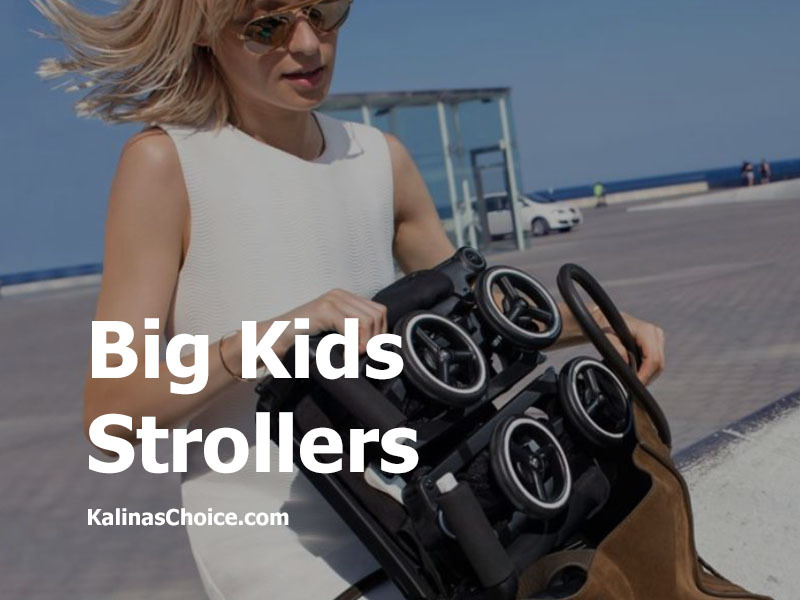 But with my comprehensive guide to shopping for the right strollers, and my favorite picks for some of the best strollers for 3, 4 and 5-year-olds, you’ll find something that will suit your needs. Another recommendable stroller for 3-year-old kids is the Pockit Lightweight Stroller, which comes fully assembled and is super convenient. Weighing 9 lbs., this stroller is among the most compact strollers on the market with amazing stability, handling, maneuverability, and adaptability. Because of its compactness, lightweight and flexible fold system, the Pockit Lightweight Stroller is a convenient option for trips and long travels as it can fold and fit in small spaces. Made from high-quality, durable material, it can hold up to 55 pounds in its carrier space and 11 pounds in the convenient storage basket. Another amazing thing about this stroller is the travel system technology that makes it a versatile option for most individuals. The Pockit Lightweight Stroller is equipped with a safety belt and comfort pads that can be adjusted at different heights for a cozy and secure fit. 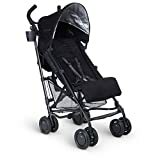 The Joovy Zoom 360 Ultralight is one of my favorite strollers that can be used from birth (travel system) until your child outgrows it, which will probably be in early elementary school age (3 years). Being the upgraded version of the Zoom 360, you’ll be getting several useful features at a relatively fair price. This 3-wheel stroller features rear-wheel suspension, locking the swivel front wheel, a parent console, pneumatic tire, and an under-seat storage bin, making it a convenient option for everyday use (especially jogging). The rear-wheel suspension together with pneumatic tires can handle any terrain, thus assuring you of a smooth ride and great maneuverability. In terms of sturdiness and stability, the Joovy Zoom 360 Ultralight’s frame is made with the durable 600D polyester and aircraft-grade aluminum, material. This makes the stroller very sturdy and stable, despite weighing 25.7 lbs. and ready for s different use – tough and rough. With a weight limit of up to 75 lbs. the Zoom 360 is indeed a great option for most kids up to the age of 7, making my favorite option for 3-year-olds too. It also features tons of storage spaces including the large basket, large mesh-pocket in the back of the adjustable seat, two mesh pockets in the seat, and a parent organizer. The folding system works well and the stroller takes up less space in your car, garage or closet. Not forgetting to mention the amazing and adjustable 5-point harness system to keep the kid safe, as well as the adjustable seat that lets your kid sit upright or reclined. Baby Jogger understands that bulky strollers often make traveling with kids difficult. As a result, they have managed to come up with compact strollers that are easy to fold, set up and maneuver. One of the best releases in their line of strollers is the City Tour stroller which is equipped with all sorts of features to help you navigate sidewalks, bus terminals, airports and other public spaces with ease. This budget-friendly buggy weighs 14 lbs. with and a maximum weight capacity of 45 lbs. making it a suitable option for infants and preschool kids aged 4. It has a roomy seat that is adjustable and can be reclined to accommodate your kid comfortably. Baby Jogger is well-known for large canopies and the City Tour doesn’t disappoint. It features a large UV 50+ three panel canopy with canopy extension (pop-out sun visor) and a peek-a-boo window. One of the most impressive features of City Tour is the compact one-hand fold system. You can simply hold the child in one hand and use the other to fold it. It has enough room to add a car seat which makes it easy to be transformed into a travel system for convenience. Storage should be a concern as the stroller features a convenient under-seat storage basket that offers enough space for extras. UPPAbaby G-LUXE stroller makes it on my list because of its modern features and amazing strength. As you already know UPPAbaby has been upgrading all their models and G-Luke wasn’t an exception. Weighing 15 lbs., the latest G-Luxe is widely appreciated for its strong profile and the one-action brake. The UPPAbaby G-Luxe is a strong, lightweight umbrella stroller with a one-handed recline feature that allows for much-needed naptime on the go. The smooth ride and essential conveniences make this one of my favorite picks for the young toddler (4-year-old) graduating from that big stroller. This big-kid umbrella stroller has a canopy which is vital for taller and bigger kids. The canopy extends as a sunshade protecting the kid from the sun and light showers. The tall handlebars fit both short and tall parents (pushers), besides having an under-seat basket and a cup holder. Though this stroller has no option for attaching a car seat, the seat is comfortable, well-padded and reclines very easily. With a maximum load capacity of 55 lbs. and a carrying strap, it’s the right travel option for most parents. In my opinion, the BOB Revolution PRO Jogging Stroller is one of the biggest single jogging strollers for big kids. It’s often used for big kids (5-year-olds) as it weighs 30.5lbs with a maximum weight capacity of 75lbs. It comes with a huge canopy to give your baby maximum protection from all weather conditions. Its fold system is fully functional that it can easily fold flat, making it portable and can fit in the tightest space. The adjustable suspension is also worth mentioning as it helps the stroller suit most terrains. With its 3-wheel design, pneumatic tires and swiveling-lock front wheel BOB Revolution PRO is exceptionally stable and agile. It can maneuver through tight turns with the wheels rolling on any type of terrain: gravel, grass, mud, and sand. The BOB Revolution Pro features a standard on/off foot (rear drum) brake positioned on the rear wheels axle and a hand-held brake located on the left-hand side handle. This makes a perfect option when you’re out any activity since you have the freedom of using either your hands or feet to slow the buggy. Another amazing feature is the five-point harness system which is nicely padded with thick, adjustable straps that hold the passenger in a proper position through the ride. If you’re looking for a budget-friendly, maneuverable tandem stroller and to navigate tight spaces effortlessly, then the Joovy Caboose may have the ideal product for you. The Joovy Caboose Ultralight Graphite is a double stroller with a sit-and-stand capability and 20 percent lighter than most analogous buggies available on the market today. This sit-and-stand product is a better option thanks to its lightweight design, small fold system, and easy to use features. The double stroller will offer your big kid the freedom to decide on three positions including sitting, standing, and walking. Because of this distinct feature, most users find the Joovy Caboose Stand-On Tandem Stroller as the right option for their kids for its healthy freedom, which is a win-win for both kids and parents alike. It also offers a cool, modern-day style and the canopies are made from the strong 600D nylon fabric to offer the passenger a cool ride, protecting them from the scorching sun. It comes with an improved, large storage basket with side pockets that you can use to hold other essentials. This double stroller from Joovy assures you of a smooth ride thanks to its four-wheel suspension and reachable brakes. The Thule Urban Glide is another preferred jogging stroller because it’s lightweight, ease of maneuverability and impressive run-ability. And with a maximum weight capacity of 75 lbs. and a wide seating, it’s among the most jogging stroller for older kids, especially 4 and 5-year-olds. This stroller offers an amazing combination of features, high performance, and convenience making it a great everyday buggy for most parents looking to stay fit. Besides, it has a fully functional design made of high-quality materials meaning it’s easy to use and comfortable for both the pusher and passenger. Another amazing feature of this stroller is the two big 16-inch rear wheel and the 12-inch front wheel. The swivel front wheel offers more maneuverability and can be locked for better stability. It also features a functional rear-suspension system which absorbs all impact for smooth rides. Then there’s the multi-position canopy providing full coverage and protection from sun rays. It also has peek-a-boo with a magnetic closure. Whether your kid grows faster than his/her age mates and has already outgrown the existing stroller or he just needs to ride in a stroller because of a medical condition or unable to cover long distances on foot, there’s always a right stroller for you. Here are the key things to keep in mind when you go out looking for your kid’s stroller. Whenever you go shopping for a stroller the most important factor you should take into consideration is usage. You should be realistic about how/what you plan to use the stroller for. This starts by considering the kid’s age, weight, and health status because strollers have limits for weight and baby sizes. Besides, there are several strollers that can adjust through babyhood – from reclining to sitting. Once you’ve taken the kid’s age and weight into consideration, you’re required to make your selection based on your lifestyle by understanding how you would use the stroller. Whether it’s for walks on pathways, occasional trips to the mall or certain medical conditions. For instance, if your kid is recovering from surgery or suffering from other medical conditions your doctor will help find the right stroller. If you will be using public transport, think of something lightweight, compact and easy to fold. Once you’re done assessing why you need the stroller and what you’ll be using it for, it’s high time you took a look at the different types of strollers available on the market. Standard Strollers: These are the most common (old-fashioned and heavy) strollers that come in different designs with all sorts of features you might need. Most of them have padded seats that can be inclined in different positions allowing the kid to sit comfortably. Their disadvantage is the bulkiness. Lightweight Strollers: These are better for toddlers and older kids, and perfect for long distance trips. They are usually light and fold-up compactly, with less padding. Most models aren’t proper for infants since they don’t have enough padding and support. Jogging Strollers: These are meant for parents who may need to exercise with their babies. They feature 3-bicycle wheels on a light, strong frame able to deliver smooth handling for the pusher and smooth ride for the passenger. Travel Systems: This is the most innovative type of strollers (improved from jogging and standard strollers) that can carry infant car seats. They are larger, weightier and more expensive, and can be used with preschool kids. They come with matching infant car seats. Double Strollers: These lets parents push two kids at once. Most models have space for preschool kids and infants, while others are meant for twins (infants). Safety is another important factor to consider. How strong is the stroller? Will it remain sturdy and stable with the kid and other accessories, hanging with its handle? How reliable is the harness system? You need to ensure the harness system has a five-point system to keep the baby well-strapped. Try to find pinch point where your kid may hurt his/her fingers. Not forgetting to mention, how well the brakes work and the handling factor. The stroller should offer a smooth ride and handling for both the pusher and passenger. This is where you check for Maneuverability and Handling. You can push the buggy around to check if the wheels run smoothly if the handlebars are strong with a good gripe. Also, check for good maneuverability by twisting and turning it around tight and rough spaces, and how easily you can access the breaks. Different strollers come with different features to suit your lifestyle and intended use. You’ll need to prioritize your needs and ensure the features it offers are in line with your demands. These include adjustable seats that assure you of adaptability, snack trays, rain hood, diaper bags, drink holders, and toy bars. Other factors you must take into consideration include the Fold System, Size of the Wheels, Handling Height, Storage, Washable Fabric, Versatility, Care and Maintenance, Aesthetic and Budget. Photo by http://gbchildusa.com, Modified by Author.